Team Arrow mourns the loss of Oliver to the League of Assasins and must come to terms with moving on without him. Meanwhile, new "dark" Ollie has his sights set on Nyssa but she's about to get some unexpected backup. Check out a new clip plus a behind-the-scenes featurette with executive producer Marc Guggenheim. Arrow airs Wednesday nights at 8 p.m. ET/PT on The CW. THE LEAGUE OF ASSASSINS SETS THEIR SIGHTS ON NYSSA -- Oliver (Stephen Amell) goes through a rigorous transformation. The League of Assassins sets their sights on Nyssa (guest star Katrina Law), who is back in Starling City training Laurel (Katie Cassidy). 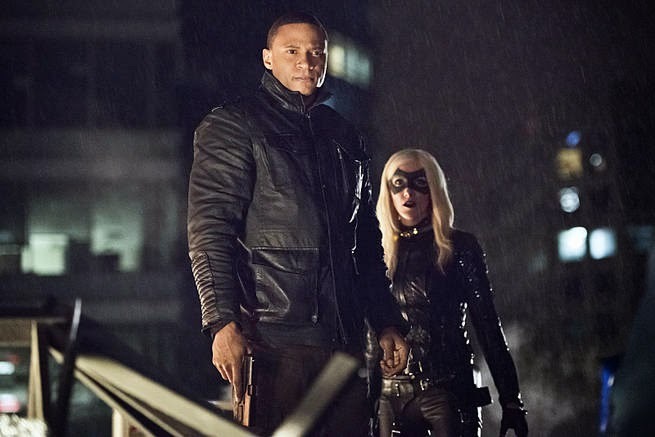 When Nyssa realizes they are coming, she arms up to face them alone but Laurel asks Felicity (Emily Bett Rickards) and Diggle (David Ramsey) to help protect her new friend. Thor Freudenthal directed the episode with story by Beth Schwartz and teleplay by Brian Ford Sullivan & Emilio Ortega Aldrich (#321). Original airdate 4/29/2015. "Gone, but not forgotten." What's next for Team Arrow? Find out on an all new episode Wednesday! "Vengeance is justice." Executive Producer Marc Guggenheim takes us inside Wednesday's all new Arrow!